Amanpulo offers 40 traditional native Casitas including 7 hillside, 4 treetop and 29 beach Casitas. These all offer excellent views and ultimate privacy. 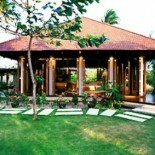 There are 8 independent villas with 4 bedrooms each and a magnificent 7 bedroom villa. Amanpulo is privately situated on its own island of Pamalican, in the Cuyo Islands, south-west of Manila in the Phillipines. An exceptionally spectacular archipelago of over 7000 tropical islands, dotted in the eye-wateringly blue seas of South East Asia. Guests are met at Manila's international airport and taken by complimentary transfer to the Amanpulo lounge, located at a nearby hangar. Complimentary refreshments are served at the lounge. A selection of books, newspapers, magazines and games, luggage storage and shower facilities are also available. Guests fly directly to Pamalican Island in a 19-seat, twin-engine turboprop, landing at the resort’s private airstrip. Flight time is one hour. Amanpulo luxury resort is situated on its own private island in the shockingly beautiful Cuyo Islands, south-west of Manila in the Philippines. This exceptional archipelago is made up of over 7000 tropical islands with powder white sandm surrounded by indigo seas. Amanpulo’s island of Pamalican is greeted with coral reef only 300m from the shore. Amanpulo is a serene private island serving a tribute to nature with its traditionally style architecture and profound ‘South Seas’ interpretation. 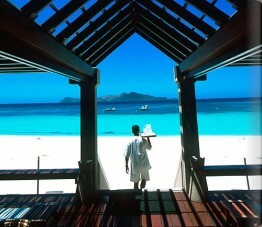 Amanpulo combines exclusive comfort and modern technology in a remarkable unassuming setting. This is true escape from the markings of modern life. The 40 Beach, Hillside and Treetop Casitas on Amanpulo are modelled on authentic bahay kubo dwellings, each with its own golf cart for island exploration. This romantic island retreat caters for the active and for those who wish to think of nothing more than been pampered by that eye-watering blue sea. Enjoy a myriad of marine activities, island walks, cruising adventures or tennis and if that doesn’t wear you out, venture into the air-conditioned gym. For the more languid, enjoy holistic body treatments in the open air garden or beach salas, take a few relaxed strokes in the serene 30m swimming pool or pass an afternoon swinging lazily in a hammock. With lush tropical foliage, silicon white sand and endless stretches of indigo blue, this island paradise is a true gift from nature. Amanpulo offers a full range of activities for fun and relaxation. From the beach club, there is snorkelling and scuba, windsurfer, sailing, fishing and cruising. 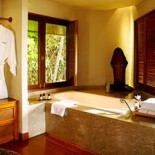 The spa casita is the place for relaxation offering massage, scrubs and a full range of beauty treatments.